The Nike-Hercules was an early defense missile, designed to counter the threat of Soviet bombers. It was a substantial improvement over the Nike-Ajax in terms of distance, accuracy and power. With sites deployed throughout the United States, it is one of the most recognizable military missiles in the US aresenal. The 1/12 scale Roachwerks rendering is meticulously researched and designed to exacting specifications. For improved stability, the upper fins are slightly undersized, but this is otherwise a highly accurate scale kit with an impressive 4x24mm cluster and flies wonderfully. While the original was a 2-stage rocket, this kit is designed for single stage flight though could certainly be converted to staged flight with minor modifications. As with all Roachwerks kits, it is only available as a limited edition run, though there are also 4x18 and 4x13 versions in the works. The kit includes a CD-ROM with instructions, CAD drawings, PDF's of all drawings/templates and Rocksim files. Very thorough and the PDF files come in handy for printing spares for testing and/or rework. Of course if lack of printed directions are a problem, you'll have to print out a set on your own from the CD. Overall the instructions are generally well written, supported by B & W photos and written by an experienced builder for the experienced builder. Prior experience is a good idea here and familiarity with the Nike-Hercules helps as well. I was fortunate enough to have picked up a Mike Doffler replica disk a few years ago which was loaded with background information and scale data on the Nike-Hercules. Overall I would rate this a skill level 3 kit, though I went about it applying skill level 5 techniques in order to make this an NAR competition model worthy of regional or even NARAM sport scale competition. Construction begins with a set of 4 motor mounts. Fairly standard stuff with an internal centering ring motor block, pair of CR50/55 rings and metal hook. One thing I found a bit odd was that I had a thin fiber centering ring and a thicker wound ring for each tube, giving me the impression that this was an early edition kit and some of the details were still being worked out (mine was serial #5). The 4 motor tubes are then bonded inside BT-55 tanks. The tanks, in turn, are bonded together in a 4-motor clustered pattern. For scale-like appearance, they are actually separated a bit by a pair of spacers. This limits the amount of surface area connecting the tubes, so it will need a good glue joint. With the lower tank assembly completed, it's time to move on to shaping of the transition. The transition on this rocket is a real work of art, very carefully machined. Not only does it exhibit complex geometry externally but it is also drilled for the 4-motor cluster and upper stage boattail. It is turned oversized though, so needs to be sanded down a good bit to conform to the tanks. After shaping it, it's a good idea to sand the insides a bit as they are pretty rough plus coat everything with a good layer of wood glue or epoxy to prevent ejection charges from burning through the balsa. On my kit, I wound up spending a bunch of time treating the wood grain and sanding down to a nice smooth finish before I realized that the transition was machined wrong and a bit too tall. With the contest deadline looming, I sent a panicked note to Sandman (aka Gordon Agnello of Roachwerks), who assured me I'd have a replacement in a few days. A few days? The contest was 3 days away and I needed at least 1 very long evening to shape, surface prep, prime and paint. Around 11:00 PM I sent him a request to expedite and started looking over my collection for a plan B to enter in the contest. The next morning before heading out to work, I caught an update from Sandman that he'd turned me a new transition overnight and was sending it out Express Mail that morning. Wow! What an amazing response to a desperate plea for help! The replacement arrived the next day in beautiful shape and I had a long night of work but got it prepped and ready in time. The last aspect of booster work involved the fins. 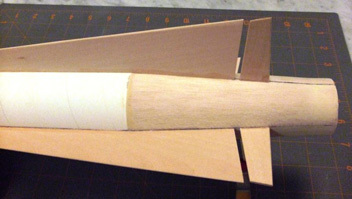 There are 4 rough-cut balsa fins which you need to sand down to sharp leading and trailing edges and leave a pronounced centerline. There are templates to assist with this, though I wound up simply masking off my center line and sanding down each edge on my own. I then used the templates as skins. Not only did this save me some time filling the gains but I had requested a special version of the patterns that included rivet details. I wound up applying tiny glue-dots where the pattern sheet indicated bolts for added realism. When the fins are finished, you can either bond them to the tanks or for better looking finish, paint the tanks olive drab first and paint the fins flat white then tack the fins on with a very thin layer of epoxy. This avoids a painful masking task later. The sustainer is a bit simpler. You start with a beautiful balsa boattail, bonded to a BT-70 (after anchoring a Kevlar shock cord to a screw eye). Next bond a set of 4 laser-cut basswood fins. Since the fins span most of the BT-70 plus sweep down the transition, they need to be carefully sanded to fit. Fortunately, the laser-cut does a very good job of getting them pretty close, so the trim and fit effort was minimal. 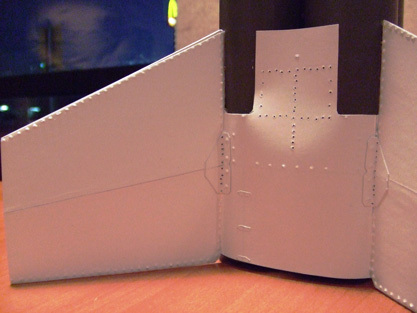 Once the fins are in place, attach 4 elevons to the boattail about 1/8" aft of the sustainer fins. I used a steel ruler and clamps to keep everything precisely aligned. Next, you get to cut (8) hinge pieces and antennae from leftover basswood stock. I decided to postpone this step until I could concentrate on doing all the do-dads which turned out to be a mistake. Without the hinges glued in place to the elevons and sustainer fin trailing edges, the elevons are barely attached to the boattail and prone to breaking off. I think I had to reattched 3 elevons during this build. 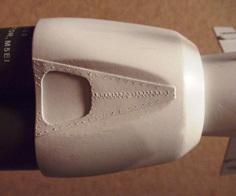 There are two more sets of fins (technically extensions of the sustainer fins) that get bonded to the nose cone. Again, careful alignment using a steel ruler and clamps is advised. Also, make sure to mark an alignment line on the nose cone shoulder and inside of the BT-70 for orientation later, just to make sure the fins are perfectly aligned throughout. As with the lower fins, I passed on grain filling to apply skins instead which included rivet and bolt details. The completed nose/sustainer assembly is then bonded to the transition and painted a flat white. Once the paint has cured out, you can epoxy the sustainer assembly to the booster tank assembly (assuming it's already been painted olive drab). There are two lead weights provided for nose weight. You can probably get by with just one (the Rocksim file included provides the target CG location) but I was conservative and went with 2, which would enable other motor selections such as 4 E9's or possibly even clustering F12's if I want to get really daring. Construction is then completed by applying a skin/wrap to the lower tanks between the fins. Mine didn't quite line up perfectly, indicating a slight error in fin alignment. As I fumed over touching up and adjusting, it dawned on me that this would probably have been a much better idea to bond the wrap FIRST, ahead of the fins. There are additional optional details that can be made, most notably a set of elevon lock plates. I had to skip out on this in the interest of making my deadline and because they appeared to be incredibly difficult to make by hand compared to the slight benefit visually they'd offer. Looking over the fantastic detailing of bolt and rivet patterns, I decided to go a little nuts before painting. First, I picked up a set of syringes and micro tips from Lee Valley Tools. I loaded a syring with 10% dilluted white glue and started making tiny little glue-drop bolts. Next, I used a 0.3mm drill bit and Dremel to score out little recesses for the rivets. All told, there are over 5000 rivets and bolts on the finished model. This little diversion wound up taking about 5 hours one evening but I think the effect was well worth it. The model is stunning when viewed up close. I also printed out copies of most of the wraps and templates and cut out cardstock layers to make hinge and brackets, which I attached overlaying the pre-printed patterns on the wraps, giving it a 3-D finish. Painting as noted, was largely done before the final assembly. I used Testors rattle can olive drab and Krylon semi-gloss white. Once the olive drab had dried, I then applied the Excelsior decals supplied with the kit and used a 3-part Micro Scale series of decal treatments. I finished up with 3 light coats of Testor's lusterless clearcoat. This took care of the mismatch between the gloss finish of the decals and the flat finish of the painted surfaces. It's going that extra mile or so that I think sets this apart from my typical finishes, and the finished model is quite impressive. For the maiden flight, I went with the recommended cluster set of 4 D12-5's. I checked the igniters carefully, cherry-picking the best I had handy. I then hooked up a 4-motor clip-whip and went to the pad. I had skipped the launch lugs in favor of a pop lug for an even more scale-like appearance and the pop lug fit snugly on the rocket and then down the 3/16 rod. Given the weight of the rocket, I'll consider using rail buttons on my pop lug in the future, as there is a fair amount of rod whip. The motors all lit immediately and the rocket took off surprisingly quickly. I was very impressed with the flight, perfectly straight and not a trace of roll. It weathercocked slightly in the 8 mph winds. The 5 second delay was the right choice, as the model had just arced over when I could pick out the distinct pops of 4 different ejection charges. I would estimate altitude to be around 400-500 feet. Sandman's wife hand sews the nylon chutes in his kits. This kit came with a beautiful yellow and purple X-form chute which I thought would be a fine choice given the winds. The chute deployed perfectly though one of the shroud lines tore loose from the stitches holding it to the nylon, so the descent was agonizingly fast. I lucked out in that the field was soaking wet and muddy from near flood rains the past few days. Even though the rocket came down fairly quickly, there was no damage at all. Overall, this is a very impressive scale rendering with exceptional quality parts. It is not true scale (sustainer fins undersized) but could easily be modified to get there. It flies very well and is a great kit for the craftsman. My only "cons" are minor with the hinges and antenna should have been included on the laser nest rather than cut by hand from the basswood scrap and my decals were white instead of yellow. 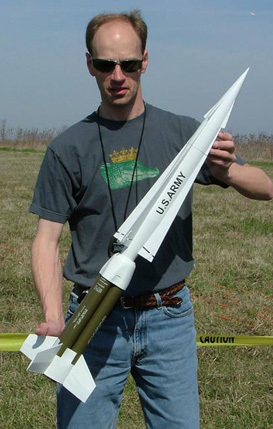 While there is some evidence that there were white-lettered missiles as well as yellow-lettered missiles, the overwhelming majority of publicly available photos shows yellow lettering, which means it is going to be difficult to provide supporting photos when this is entered in contests. I am delighted with the performance of the Lee Valley Tools syringe I used for glue bolt heads. In addition to doing a good job on that tiny detail, I am also starting to use it to apply razor thin fillets. Please Help Make Us Better!